Monitor lizards are genus Varanus reptiles that are big-to-massive in size. Some classic species of monitor lizards include the the Nile monitor lizard, Gray's monitor lizard, the Komodo dragon, mangrove monitor lizard and Panay monitor lizard, although the list goes on and on and on. Monitor lizards come from many different corners of the planet, and as a result reside in many different types of habitats. Some monitor lizards live exclusively in the Philippines, such as the Panay monitor lizard (Varanus mabitang) and the Gray's monitor lizard (Varanus olivaceus). The Panay monitor lizard comes from the Filipino isle of the same name, and is common in rugged mountainous regions, where they spend most of their time up in trees. The elusive Gray's monitor lizard lives on Catanduanes and Luzon islands, and usually lives in damp tropical forest environments, particularly those that feature either cliffs or rugged outcrops. 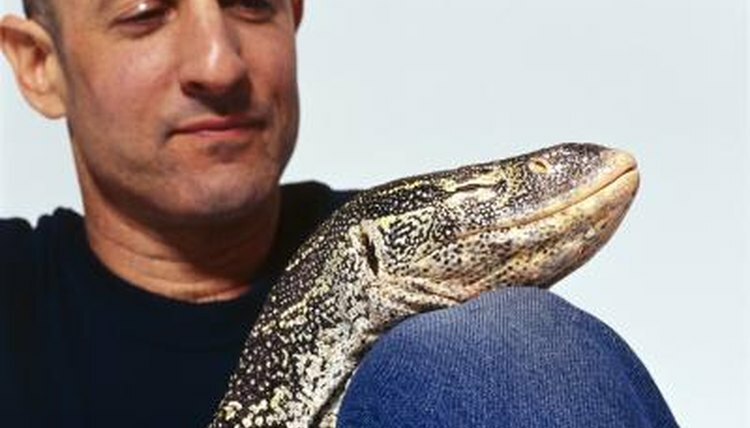 Several species of monitor lizards also hail from Down Under. Australian monitor lizards are known as "goannas," and include the lace monitor lizard (Varanus varius), sand goanna (Varanus gouldii) and Spencer's goanna (Varanus spenceri). Lace monitor lizards often live in woodlands, forests and open tablelands. Sand goannas also are prevalent in woodlands and arid open environments. Spencer's goannas (Varanus spenceri) reside solely in grassy habitats amid clay plains. Some monitor lizard species originate in Africa, such as the Savannah monitor (Varanus exanthematicus) and the Nile monitor lizard (Varanus niloticus). Savannah monitor lizards live in central Africa's grasslands and savannahs, while Nile monitor lizards, which come from central and southern regions of Africa, have a very diverse array of habitat options including scrubland, woodlands, marshes, swamps and evergreen thickets. Nile monitor lizards are especially prevalent by lakes and rivers. Indonesia has its fair share of resident monitor lizard species, including the immense Komodo dragon (Varanus komodoensis) and mangrove monitor lizard (Varanus indicus). Komodo dragons are the biggest lizards alive on earth, according to the Smithsonian National Zoological Park, and inhabit savanna forests in tropical regions. Occasionally, these reptiles even live in beach environments. Mangrove monitor lizards are common in mangrove forests, as their names imply, and also in coastal regions. They also frequently live in close proximity to human establishments, such as coconut plantations. Mangrove monitors do not live solely in Indonesia, however. These lizards also are a relatively common sight in Papua New Guinea and Australia. Outside of the Philippines and Indonesia, southern parts of Asia still are home to seemingly countless other varieties of monitor lizards. One such example is the common water monitor (Varanus salvator), which lives in mangrove swamp and forest settings throughout the region. The Bengal monitor lizard (Varanus bengalensis) is another Asian fixture, and is found from Thailand to Pakistan. Bengal monitor lizards frequently reside near agricultural locales, as well as in forests, scrublands and deserts. Bengal monitor lizards spend the bulk of their time on the ground, although they are very capable climbers. What Animals Are Native to Paraguay?